A large project is underway to reintroduce a small species of tiger beetle to an area they have historically referred to as ‘home’. When the puritan tiger beetles were listed as threatened in 1990, conservation efforts began to help protect current habitats locations and keep the beetle from becoming further extirpated. The Puritan Tiger Beetle Recovery Project was initiated to help restore the beetle to its current and historic habitats along the Connecticut River. The Project consists of students and interns from several northeast colleges, the Silvio O. Conte National Fish and Wildlife Refuge, and volunteers throughout Western Massachusetts. The team utilizes the Richard Cronin Aquatic Resource Center in Sunderland, MA as the official site to conduct the necessary lab work for the project where they work together everyday to ensure the project runs smoothly. Rodger imagined a project like this when he got curious about tiger beetles as an undergraduate. 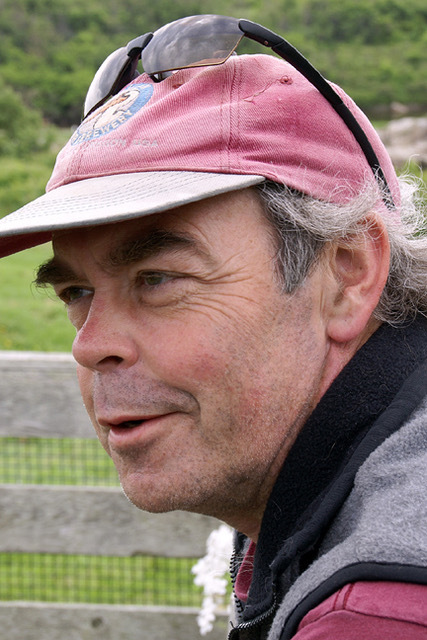 When describing the projects focus, he says “To learn how we establish stable puritan tiger beetle populations throughout the Connecticut River, our project has two broad questions: 1) What ecological conditions make ‘good habitats’ good?, and 2) How can captive reared larvae be used to establish new populations?” In the wild, it takes the puritan tiger beetle about two years to reach their adult stage. The lab-reared larvae grow in a fraction of this time. This process ensures they’re reintroduced without the substantial loss that would naturally occur in the wild. 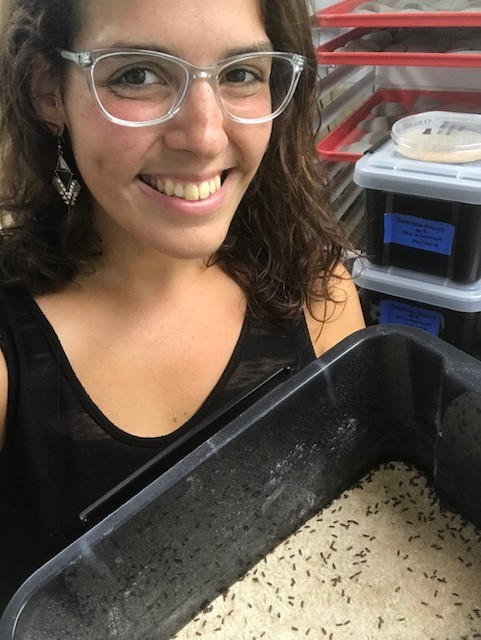 Robin is currently studying the puritan tiger beetle populations in Cromwell, CT and Northampton, MA in order to create a life table for them. Robin surveys the total number and the larval stages of each burrow in order to learn the survival rate of each instar (stages). By incorporating egg hatching percentages from Rodger’s lab data and adult populations from Chris Davis’ field surveys, Robin will be able to calculate an overall survival rate from egg to adult of puritan tiger beetle. Kate is one of two assistant laboratory managers. Her main focus is maintaining the beetles in the lab, and assisting with student projects. Kate is also working on a project of her own aside from the Puritan Tiger Beetle Recover Project. 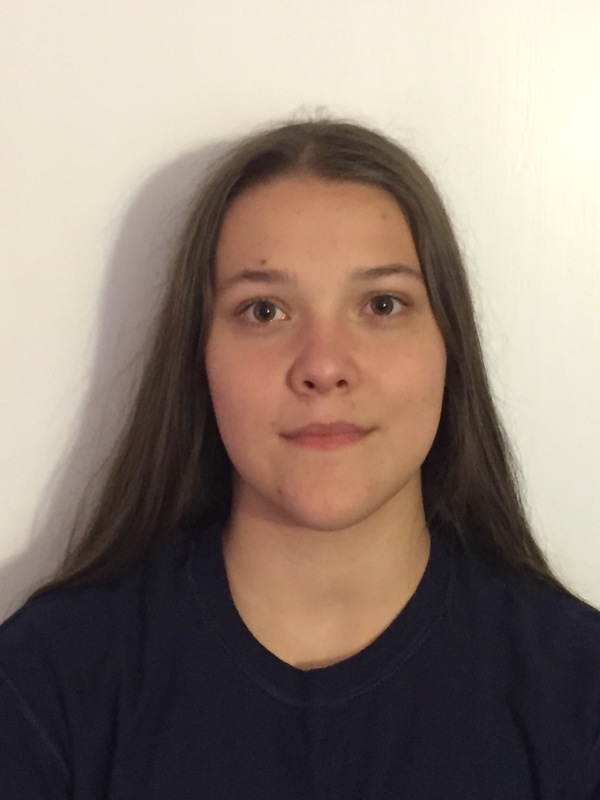 Kate’s project aims to understand how sediment (sand/silt/clay) type influences oviposition (egg laying) in the laboratory environment, and whether female puritan tiger beetles prefer a specific sediment type. Neil assists with the collection of adult puritan tiger beetle for lab rearing, and spends most of his time in the field observing the beetles in their natural habitat. Neil is currently in the process of identifying a potential habitat in Vermont. Caleb is striving to succeed in the field as a wildlife biologist. He is currently working on a research paper where he explores what puritan tiger beetles are eating. “It is often assumed that they are generalists”, Caleb explains, “but I am looking to see if there is any particular prey that makes up a larger portion of their diet”. Caleb also explains that this information will be useful in reintroducing the Puritan Tiger Beetle to their habitat since the presence of potential prey at a new site could be an indicator of survival success. While adults and larvae are in the lab, Mary maintains colonies of various feeder insects to feed the captive puritan tiger beetle. “The goal is to keep their diet relatively diverse (2-3 different species of feeder insects), and to keep them well fed”, Mary explains. Growing larvae rely on large amounts of food in order to effectively develop into their next instar (stages), and they’re surprisingly aggressive eaters. 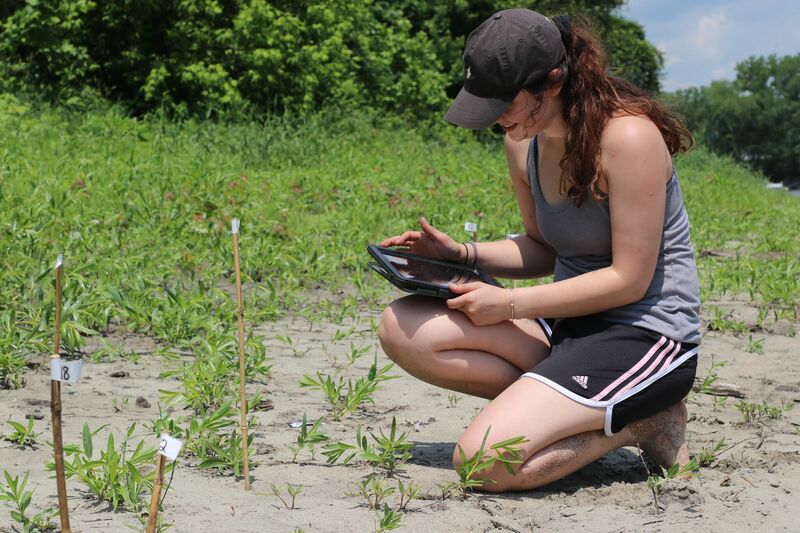 Her project aims to map the density of first, second and third instar puritan tiger beetle larvae of a successful population on the Connecticut River. By breaking the habitat up into measured square meter sections, the larval burrows can be identified by instar “age” based on size and as a particular species based on the angle of the burrow in the earth. 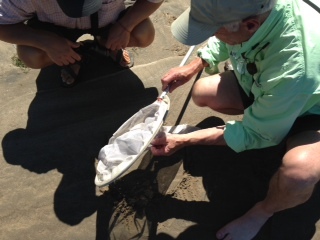 This information can be used to visually determine where larvae inhabit the beach from vegetation to water-line, and the characteristics of preferred habitat for puritan tiger beetle larvae can then be concluded for future reintroduction efforts. The sprayer system was built to aid in finding the puritan tiger beetle eggs. Using a hose and an air tattoo gun, Laura uses a faucet in the lab to give the sprayer a continuous water stream. Laura also constructed the bin and platform for the strainer to strain out the sediment and find the eggs. This system saves hours every day, when looking for eggs, and is a much safer search than digging. The clay processing is essential for the puritan tiger beetle to lay their eggs. In the lab, sand is put into deep petri dishes for the puritan tiger beetle to lay their eggs in. 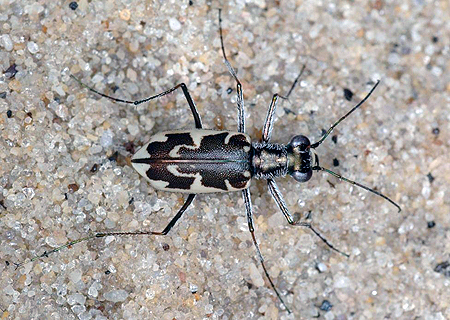 To help with this, clay which has been specially quarried from the Connecticut River by the puritan tiger beetle team, is mixed, dried, kneaded, sanitized, and kneaded again to be places around the petri dishes so that the puritan tiger beetle can climb up into the sand-filled petri dishes to lay their eggs. Without these special ramps, puritan tiger beetle are less likely to lay their eggs. 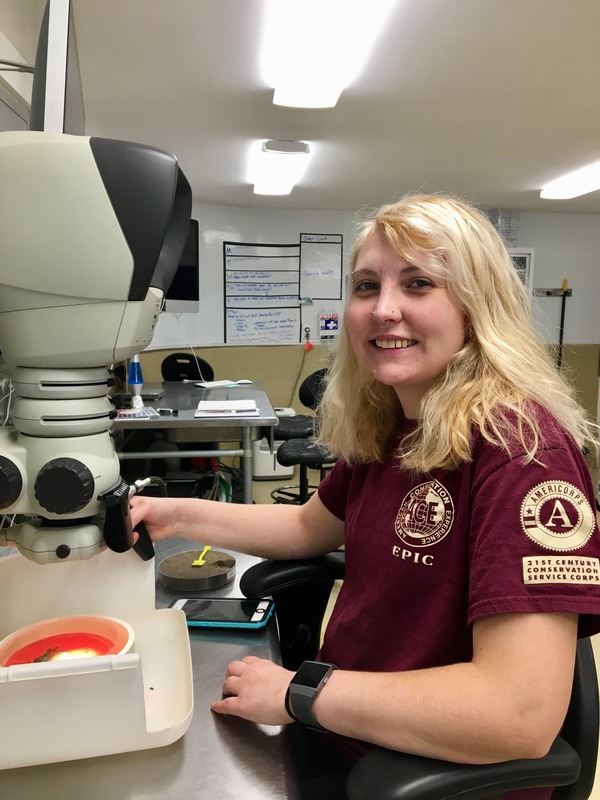 Sara is our other assistant laboratory manager for the puritan tiger beetle Lab. Sara would like to bring live tiger beetles to a wider audience. For this, she is designing, and creating a unique portable terrarium that will act as a type of “ant farm” display. In this way the larvae will develop their vertical tunnels against a glass window, which can then be used to educate the public to the life cycle of the puritan tiger beetle. However, due to the puritan tiger beetle’s endangered status, Sara will be using the bronze tiger beetle (Cicindela repanda) because they are a common species, with a similar life cycle. Hal joined the Puritan Tiger Beetle Recovery Project this year to coordinate the community of volunteers helping with the project. In addition, Hal offers scientific advice, and a career’s worth of research, and applied conservation experience to benefit the project results. For his day job, Kevin is Director of Information Systems for the town of Belchertown, MA, where he helps keep the town digitally connected. 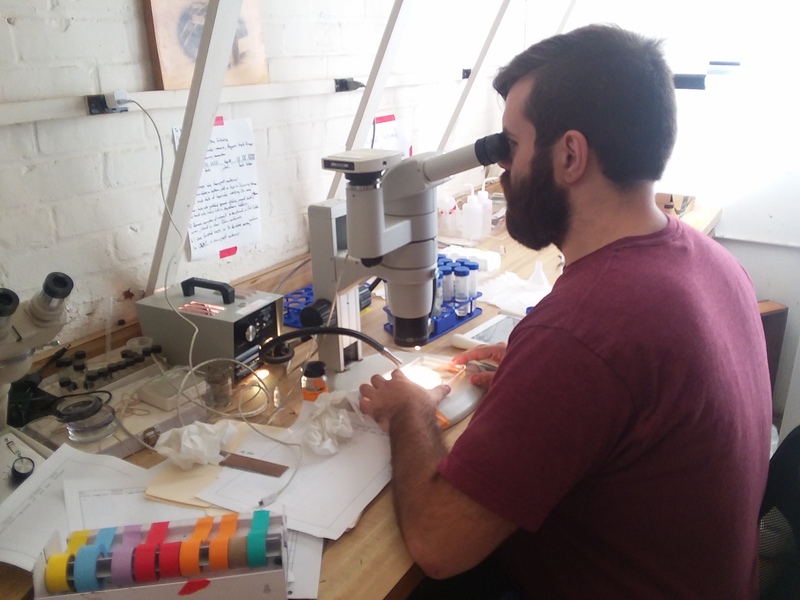 In his spare time, Kevin volunteers to digitally connect the recovery team with the puritan tiger beetle Lab. In the lab, the puritan tiger beetle adults and larvae live in a carefully controlled environmental room. For this room, Kevin has built custom computers and written code for them to create an internet-capable computing system which controls, monitors, and records data on all aspects of the beetle’s environment. With Kevin’s system, the lab team is instantly alerted by text and email if the building looses power, internet, or the environmental conditions change. Above are just a few of the people who are dedicating their time to conserve the puritan tiger beetle. Working in the field of conservation takes collaboration from everyone including many more folks working in Federal, State, NGO, Academic, and other vital volunteer roles for the team. Everyone involved in any conservation project has a different project or task that will not only aid the group as a whole, but also creates greater benefits for the group, by pooling their resources. The overall outcome is rewarding! The Puritan Tiger Beetle Recovery Project provides collaborative opportunities for those interested in working in the field of conservation. In particular, for students looking for a career in conservation, it provides a venue to conduct scientific experiments and studies of their own, while also interacting with professional biologists in the field. All the combined work and effort will not only aid in the reintroduction of the puritan tiger beetle, it’s something students can use toward a future career path. Stay tuned for the next blog post that will talk about the reintroduction and the projects progress…. This entry was posted in Blog entries, Endangered Species, Youth and tagged beetle, intern, Internship, puritan tiger beetle, richard cronin aquatic resource center, Silvio O. Conte National Fish and Wildlife Refuge on October 2, 2018 by U.S. Fish and Wildlife Service. I’ve caught what some people call the “bird bug” – AKA the overwhelming joy that follows after working with cool avian critters. I took in the full expanse of the beach, with lapping waves and a calm endless stretch of sea. It was about 8 in the morning. I waded up to my knees carrying my provisions above my head. As I climbed aboard the boat, I buckled my life vest and grabbed the metal pole beside the steering wheel. Kate Iaquinto, Monomoy National Wildlife Refuge’s wildlife biologist, took the helm and we started across the open water. The ocean smelled amazing. It was clear skies and sunny, and the rush of the speed and ocean breeze made it very comfortable. The little furry brown heads of seals popped up from time to time, curious about our passing. After about 10 minutes, we dropped anchor and we waded our way through the water past trails of horseshoe crabs and onto shore. As I looked ahead, birds were everywhere. As I wasn’t too confident in my bird identification abilities yet, I asked myself were all of these birds terns? I followed behind Kate until we came to the camp site set up with tents. In a stretch of sand about 7 miles long, I was informed there were 11,723 pairs of common terns on the island! After not being in the tern colony for more than 2 minutes, poop flew down from the sky onto Kate’s face barely missing her mouth. It was inevitable really, and it could only mean good luck, right? I was informed to grab a yellow hard hat with marker flags to protect the terns and my head, and off I went with Kate and four Student Conservation Association interns. Four speckled white and black eggs in the sand. I was surprised at the tern interns’ intense enthusiasm about these eggs. We had passed dozens of nests already. I shortly learned, these were very different. The four interns told me this was a skimmer’s nest. I had never heard of a skimmer bird. Apparently, there had not been a skimmer’s nest observed on the island for quite a long time. What a success! 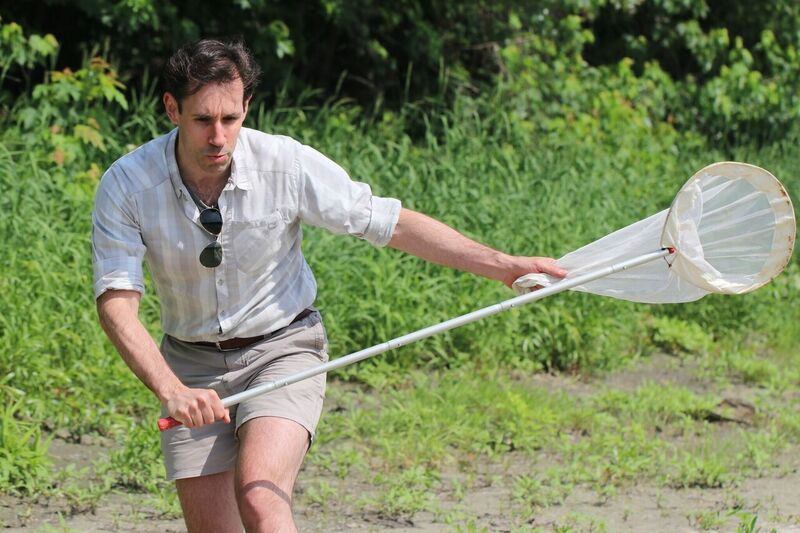 As we went out into the field, we surveyed the nesting plots where nesting adult terns and their chicks resided. And boy are the little ones expert hiders. They can find the smallest pieces of vegetation, and under its protective cover they blend in perfectly with the sand. I read off their band numbers ensuring they were present and healthy, while admiringly looking at the squirmy bodies of fluff. This process of surveying helps Kate and the tern interns identify success of terns nesting on the island. As we moved from plot to plot, laughing gulls called out in hysterical ‘has’ and I couldn’t help but also laugh myself. Common terns fledge, developing feathers for flight, between 22-28 days old. Their eggs come in a variety of colors: green, creme, turquoise, and brown, with speckled dark spots. They generally have a clutch size of about 1-4 eggs. Roseate terns, a federally endangered species, often reside within common tern colonies. Although common terns are not endangered, they are a species of concern in Massachusetts. Throughout the course of the day, I had banded four birds with the help of Kate. As I sat on the beach taking pictures, the sun cast a fine glow of colors across the horizon and a pair of oystercatchers moved along the shoreline nearby. Overall, it was amazing going out into the field at Monomoy and I am grateful to have experienced this unique adventure during my inTERNship. This entry was posted in Blog entries, Endangered Species, Migratory birds, National wildlife refuges, Science and research and tagged adventure, Birds, cape, capecod, common tern, intern, Internship, Massachusetts, Monomoy National Wildlife Refuge, ocean, roseate terns, skimmer, story, student conservation assocation on July 26, 2017 by Chloe Doe.